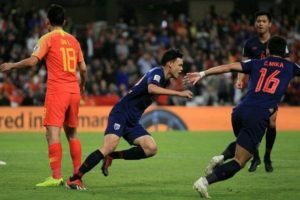 AL AIN, United Arab Emirates: China defeated Thailand 2-1 Sunday night, eliminating the War Elephants from the Asian Cup 2019 tournament. The match was decided by a penalty awarded after a foul charged to Mika Chunuonsee against Thailand in the 72nd minute, as Chinese forward Gao Lin coolly slotted home his shot to end Thailand’s chances. China now will play Iran in the Round of 8 quarter-finals. Iran defeated Oman 2-0 in Sunday night’s late game, which ran into Monday, Thailand time. Vietnam next face the winner of the Japan-Saudi Arabia match to be played Monday night. At the other end, Wu Xi’s lofted pass put Wu Lei in behind the Thai defence, but goalkeeper Siwarak Tedsungnoen was quick enough off his line to block the Shanghai SIPG man’s goalward attempt. They were unable to find a way past Siwarak Tedsungnoen in the Thai goal until the arrival of the veteran forward, who finally ended Thailand’s resistence. 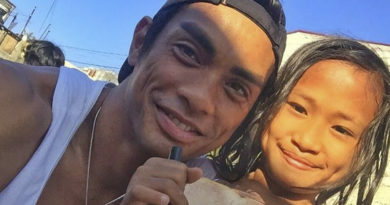 FOOTBALL-PHILIPPINE AZKALS: MANILA – Docu film ng Azkals player na naghahanap ng nanay mapapanood sa mga sinehan!